We are a society of perfection seekers – we want it all and we want it now. You know, the perfect job, the perfect house, the perfect partner. No exceptions. But does perfection truly exist? Or is it really just an illusion we chase that limits the scope of opportunities we have at our disposal? Take a peek at Mike Rowe’s response to a fan who reached out to him looking for employment advice. 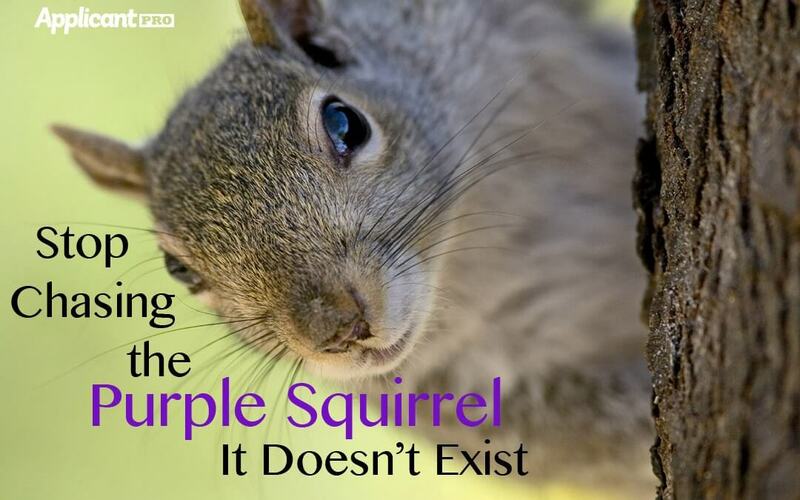 When I read through it, I immediately thought of HR professionals and how sometimes, they’re so hung up on finding the perfect fit for their positions, or, as I like to call it, the “purple squirrel” that they whittle their applicant pool down to absolutely nothing. Here’s the thing, people have a tendency to get so caught up in the minuscule details they’ve engineered in their mind, that they often miss a chance to strike gold. People have a tendency to get so caught up in the minuscule details they’ve engineered in their mind, that they often miss a chance to strike gold. Let me give you an example. I have a client who struggles to find qualified applicants to fill their sales positions. Their philosophy is: if we’re paying a high salary for these employees, we expect the very best – we want people with a proven track record. Makes sense, right? Unfortunately, these high expectations are nearly impossible to meet. At least, from the restricted lens they’re currently viewing the issue anyway. And now that the job market has picked up again, chances are, these diamond-in-the-rough employees are likely already employed. Based on their current expectations they’re limited to two outcomes – either hire a recruiter, or poach talent from competitors. A well-qualified recruiter is expensive, and a big commitment. Especially if you’re a small or mid-sized employer. And stealing employees from competitors isn’t sustainable long term because you’re going to have to pay them more than the last guy otherwise they’re not going to stick around, and once someone has been cherry-picked, they’re likely to be swiped again; what’s that motto? The best raise you can give yourself is to find a new job? It’s definitely applicable here. What do you do then? Are employers simply doomed to endure the emotional deflation that stems from hiring someone simply to fill a chair? Of course not! It’s all a matter of perspective. My blog posts have a recurring theme to them – think outside the box. I’m always trying to motivate HR to step outside of their comfort zone and view the situation from a more strategic viewpoint. Sure, I could help this client write a more optimized job ad, and we could tweak their application a bit to increase flow, but it still won’t change their screening process. What I can do though is broaden their horizons some. Instead of targeting nearby cities/suburbs, they can expand their geographic target – they can fly people in to interview, relocate them, etc. They can also change their standards for the job. I can see the glint of light reflecting from the pitchfork you’ve picked up in order to chase me off the employment island, but hear me out on this. Notice I didn’t say lower expectations because I believe that you can get the same results (aka sell the same amount if not more than you did with your previous rockstar employees) and you can pay them less. How you ask? You hire the applicants that fit the behavioral/cognitive mold of your current best sales people, with less experience and shape them to meet your goals. Since you’re hiring people with less experience, you can start them at lower salaries and use the difference to fund some all-star sales training. Create the employee you want that’s a perfect fit for your organization instead of hiring someone who is less malleable. Who knows, the employee may even exceed your expectations. The key to success with anything in life is to keep yourself open to new angles. You don’t want to chain yourself to a set process and rules for how this process is likely to reveal itself because you’re likely to overlook amazing opportunities. Open your eyes and take a risk. The outcome might surprise you.